Beacon Falls, CT – June 18, 2013 – The only place to see the laundry industry’s first Quadruple Sort folding machine will be in the Lavatec Laundry Technology (LLT) booth (3221) during Clean 2013, being held from June 20-22 at the Morial Convention Center in New Orleans. The Lavafold LFO 53 heads an entire new line of folders from this long-time industry leader, with a host of labor-saving, productivity enhancing features. 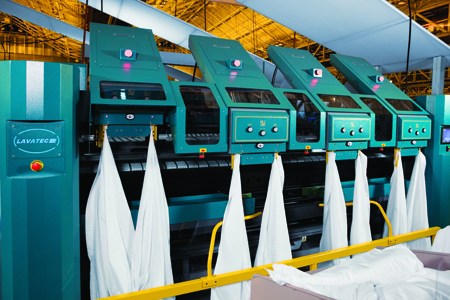 In addition to automated four-stack sorting capability, the Lavafold LFO 53 provides vacuum laydown on its in-feed conveyor (which typically boosts worker productivity 10 to 12 percent), crossfold by blade for crisper, sharper folds, and first-fold dual air jets for superior French folding on heavy items along with greater flexibility folding hand towels, blankets and garments, among other things. The Intelligent Control system comes with an easy-to-use Touch Screen interface and over 100 program options. An adjacent video screen linked to a camera below the main deck allows an operator monitor stacking action in real time. Thrasher notes that another industry leading, labor-saving and quality assurance advance available in the Lavafold series is the 5-Star Vision scanning system, which will be demonstrated in the booth at the Clean show. Three ultra-violet high-resolution cameras can process 256 graduations of RGB colors, enabling the system to sense more than 16 million colors and detecting the most minute variations in processed articles. The tri-camera setup ensures constant surveillance across the full working width of the machine as linen comes through prior to the first primary fold. The Vision system never blinks, looks away or has a bad day. Directed by 1- to 5-Star accept-or-reject specifications programmed-in by the operator, it pinpoints linens with stains or tears at the level specified for each individual client. When it spots a defect that doesn’t pass inspection, it rejects the article instantly and automatically. No one is needed to stand and stare at linen all day. For full details on the Lavafold series and Lavatec’s complete line of tunnel washers, extractors, dryers and other products, visit Booth 3221 or www.LLTusa.com. New line of folders from Lavatec Laundry Technology (LLT) includes the industry’s first Quadruple Sort folder, the Lavafold LFO 53. The unit features crossfold by blade, dual-air first-fold jets, productivity boosting vacuum lay-down and user-friendly Intelligent Controls with a Touch Screen interface. H J Weir Engineering Co. Ltd, known as “the originator of flatwork handling technology,” has been providing separating, feeding, folding and stacking solutions for more than 50 years. One of the world’s largest manufacturers of flatwork finishing equipment, they are an unrivaled leader in innovative design and advanced controls. Tri-camera 5-Star Vision scanning-grading system provides unmatched defect detection on new Lavafold series folding machines from Lavatec Laundry Technology. Detection and instant, automated defective-article rejection offers huge labor savings and quality control advantages for users everywhere.